Stack’s new range of Digital Video Recorders (DVRs) can be used as a conventional DVR to record video and audio. Now they can also record data as well as video, in one compact unit, for the ultimate in Synchronized Video-Logging! 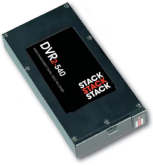 Stack DVRs can be connected directly to any Stack Dash Display or Data logging system by CAN Bus. 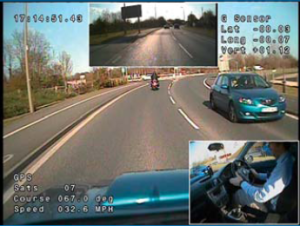 Up to 128 channels of data, including GPS and the internal 3-axis G-sensor channels, can be recorded with the video and audio. The recorded MPEG2 file can be played back directly on a DVD player or any PC media player. - CAN bus interface for direct connection to data expansion modules or ECUs. - Continuous Loop Recording modes. - Event Recorder mode, with pre- and post-trigger record periods. - Automatic motion controlled recording with in-built 3-axis g sensor. - G-force and GPS data overlay option. - Brownout protection option records up to 1 second of video after power loss. - Multiple camera options across entire range. - Fully sealed to IP67 units available. - Extended operating temperature range: -20 to +80°C available. Stack’s range of multiple camera DVRs incorporate an in-built multiple camera input (composite PAL or NTSC) video mixer. 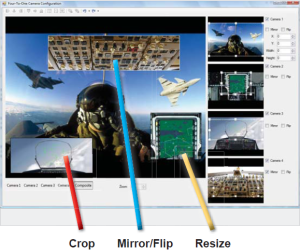 This allows any format of 1 to 3 or 4 cameras (depending on model) to be recorded simultaneously with programmable scale, crop, position, flip, mirror and position of each picture. Stack’s multiple camera input DVRs give the user full control over all screen elements with fully flexible picture-in-picture configuration. The easy-to-use software utilises a simple click and drag interface to set up how each input channel is displayed. A live view of the arranged screen is available via the DVR’s monitor output. The GPS and G-force Data Overlay option can be added easily to your DVR. Simply plug in the optional (NMEA0183 Interface) GPS receiver and speed, position, altitude, time and date information can be overlaid on the recorded video image, along with the lateral-, long- and vertical-g data from the internal 3-axis accelerometer. Data from the CAN interface, optional GPS receiver, plus the internal 3-axis G-sensor and real time clock, are recorded with the video and audio onto the CF card for subsequent replay and analysis using the Stack DataPro software supplied. Data channels can be recorded at an individual record rate of 1-500Hz. A track-map can be calculated from the GPS data, or from inertial data (speed, lateral-g force). Any point on the trackmap can be selected with one mouse-click, allowing the user to navigate through the video and data with pinpoint precision.